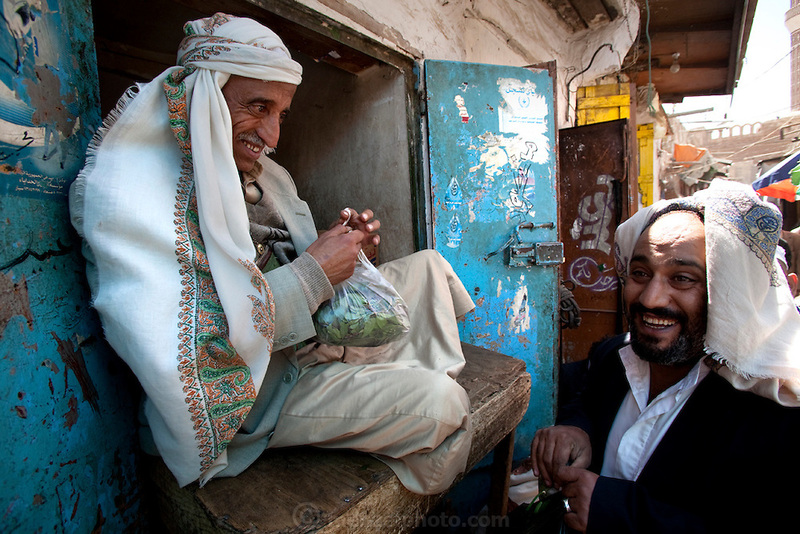 Ahmed Ahmed Swaid, a qat merchant, sits at a market in the old city of Sanaa, Yemen, and sells qat leaves in plastic bags. (From the book What I Eat: Around the World in 80 Diets.) Ahmed, who wears a jambiya dagger as many Yemeni men do, has been a qat dealer in the old city souk for eight years. Although qat chewing isn't as severe a health hazard as smoking tobacco, it has drastic social, economic, and environmental consequences. When chewed, the leaves release a mild stimulant related to amphetamines. Qat is chewed several times a week by a large percentage of the population: 90 percent of Yemen's men and 25 percent of its women. Because growing qat is 10 to 20 times more profitable than other crops, scarce groundwater is being depleted to irrigate it, to the detriment of food crops and agricultural exports. MODEL RELEASED.